Dahle now offers a line of large format rolling trimmers designed for performance and accuracy. 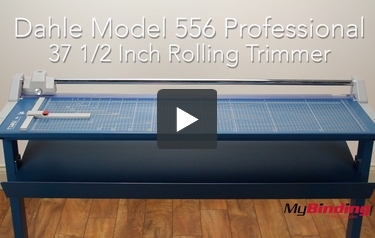 This 556S Professional LF Rolling Trimmer with Stand offers a cutting capacity of up to 14 sheets. These commercial grade trimmers feature a self sharpening blade and automatic clamping system to securely hold your work in place. A metal stand with paper catch offers a stable and secure mounting solution for the trimmer. This stand also maximizes floor space while providing an optimal and comfortable height for trimming. This trimmer is the perfect solution for cutting oversize paper, large format images, and press sheets. Dimensions: 45 1/2" x 14 1/8"
Does this cut magnet sheet? This cutter is set up to cut a maximum 14 sheets of 20 LB paper. Any other applications we would certainly want to sample before purchase. If you want to call us at 800-944-4573, we may be able to assist in getting the right cutter for you or sampling cutters with your project to insure it works.